Goodman's Guides are quick and easy-to-use reference guides for cameras and recording systems. Each guide is written from an operator's perspective to enable you to master the camera and maximize its performance in the field. Using P2? Get the new Goodman's Guide Today! 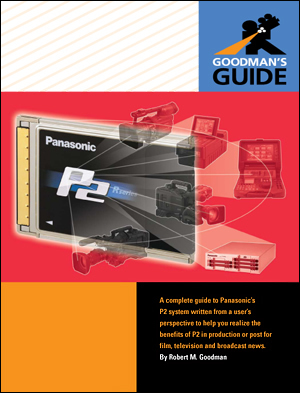 The Goodman's Guide to the Panasonic P2 System is THE comprehensive reference for: over 30 P2 camcorders and devices; techniques for production and news; and workflows for post production. The information you need is at your fingertips. Ample illustrations and photographs lead you step-by-step through dozens of P2 techniques and procedures. Clear, concise explanations answer all your questions. This ultra-practical tool is designed with you in mind. A stunning visual presentation lets you understand at a glance the entire P2 menu structure for easy navigation. It also works as a convenient index for the guide. Our rugged field-tested ring binder lets you update your Goodman’s Guide and add your own notes. Delivers the answers you need 24/7!